The ASUS VivoBook S400CA-RSI5T18 is an ultra slim, light and modern notebook with a touchscreen that will make your everyday computing tasks a breeze. It is equipped with a powerful processor, more than enough memory and plenty of storage space as well as a good quality display and sound system. Now with a great price on Amazon.com- they had a huge discount last time I checked! 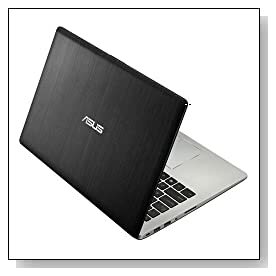 Intel Core i5 3317U at 1.7 GHz speed, 4 GB DDR3 SDRAM memory at 1600 MHz and 500 GB at 5400 RPM rotating speed hard drive + 24 GB Solid-State Drive + 32GB Cloud based ASUS WebStorage free for 3 years (valued at $50)..
SSD and Super Hybrid Engine II function allows for 2-second instant resume from sleep mode, 5 second boot-ups from zero and very quick access to your data. Cloud Web storage means you can reach your files on any device at whichever location. Auto back-up function makes sure whatever you're doing is saved when battery level drops below 5%. Windows 8 operating system may not be everyone's cup of tea but with the intuitive touchscreen built especially for the Win 8 (64 bit version) on this Asus Vivobook, you will have fun working on your everyday tasks. It is an all-glass 14 inch LED backlit HD display at 1366 x 768 pixel resolution with Intel UMA graphics card. You will also hear clearer and louder sound with a wide range and deep bass through larger speakers and Asus SonicMaster Lite technology. AudioWizard software will let you choose between movie, music and game modes depending on what you like. 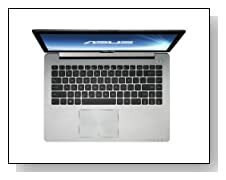 Premium brushed black aluminium metallic texture elegant Asus Vivobook comes with an ergonomic and comfortable Chiclet style keyboard (but not backlit) and its Lithium Ion Polymer battery should give you over 5 hours of battery life in daily use. Being an ultra slim and light computer at 0.80 inch thickness and 4lbs weight, there is no optical drive on it but a good selection of ports and connectivity, such as 802.11bgn wireless, 1 x USB 2.0 Port, 2 x USB 3.0 Ports, an HDMI port, a VGA port, an LAN RJ45, 1.0 MP Webcam, SD Card Reader and 2 x Audio jacks: Audio in/Mic out. Verdict: Sure, there is no backlit keyboard or optical drive on the new Asus VivoBook S400CA-RSI5T18 and the operating system is Windows 8 but you'd be very hard pressed to find a similar touchscreen notebook with the same specs and features and the world-renowned Asus quality: Great screen and sound, decent battery life, durable, reliable, functional, user friendly, modern, light weight, slim, beautiful and powerful.. If anything goes wrong, you have the 1 year Accidental Damage Protection with 30 days Zero Bright Dot Guarantee- valued at $100. So go ahead and check out the great price on Amazon.com!